You are here: Home / How much does MTConnect cost? How much does MTConnect cost to get implemented on my shop floor? Customers commonly ask how much is MTConnect to put in their shops. The average cost is around $1000, plus installation time. Okuma provides their adapters for free, while Mazak and Mitsubishi have specific adapters that they charge extra for. The best suggestion to get an accurate quote would be to contact the machine tool builder first. The control company would be your second resort, then a third-party integrator, such as SFA, is a great contact for Siemens and more machine types. For example, SFA provides MTConnect hardware adapters. We have hardware that starts at $800 and can guide you through the process of installing it. We also provide onsite services to help install the devices. “Among machine tool users, misconceptions about this data communications standard are clouding the answer to that question,” Mark Albert, Editor of Modern Machine Shop writes. “Some shops have the false impression that all MTConnect-related products will be free as Internet downloads. 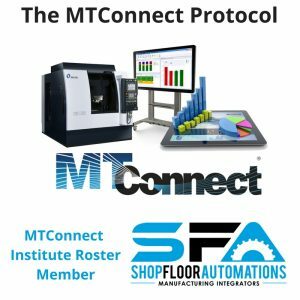 One shop explains that more than the price tag of implementing MTConnect are the benefits it brings to the shop floor. Modern Machine Shop profiled GE Aviation about their experience bringing MTConnect into their shop.